Yahoo! India is going to be a sponsor of 20/20 World Cup – maybe hindsight is indeed 20/20 ! Add to it, I had to wake up early today to watch the India -England 1-dayer also (what a match!) – phew! – it is exhausting indeed. Anyway, its the weekend – so, I am looking forward to just chill out. Today India completes 60 years of Independence. MAA TUJHE SALAAM – VANDE MATARAM ! India won a Test Series in England after a gap of 21 years when they won the nPower Test Series 1-0. The final Test match at the Oval ended in a draw. Go India! – the win must rank as one of the finest in recent history! Why is Yahoo! not helping Yahoo! Today, I heard an interesting piece of news – “Yahoo! 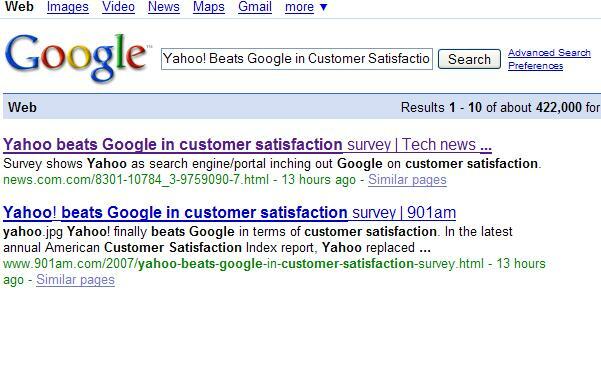 Beats Google in Customer Satisfaction” – of course, it got me all excited and the first thing I did was Search for this news. Interesting isn’t it? – maybe Yahoo! 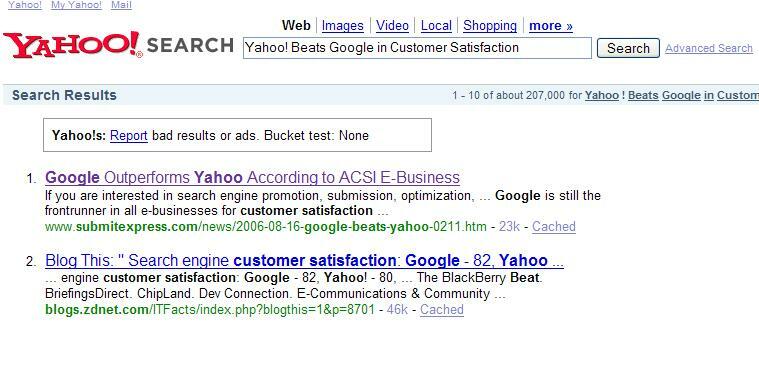 beat Google in Customer Satisfaction, but it will take a while to beat them in the Search business. Nevertheless, it is a start – as you know, in Internet, things can just grow virally! Will Zaheer and Sachin click again for India? The India England series is fantastically poised. India lead this series 1-0 and so, England will want to win the final Test at every cost. This is going to be a fantastic Test match.